In physics, a phonon is a collective excitation in a periodic, elastic arrangement of atoms or molecules in condensed matter, like solids and some liquids. Often designated a quasi-particle, it represents an excited state in the quantum mechanical quantization of the modes of vibrations of elastic structures of interacting particles. Or for simplicity: sound waves; the ordered shaking of atoms or molecules. When you hit a metal bell with a (small) hammer, or make a wineglass sing by rubbing the edges, you experience the vibrations of the object as sound. All objects in nature (going from atoms to stars) can be made to vibrate, and they do this at one or more specific frequencies : their eigenfrequencies or normal frequencies. Also single molecules, if they are hit (for example by another molecule bumping into them) or receive extra energy in another way, start to vibrate. These vibrations can take many forms (elongating and shortening of bonds, rotating of parts of the molecule with respect to other parts, flip-flopping of loose ends, and so forth) and give a unique signature to the molecule since each of these vibrations (so-called eigen-modes) corresponds with a certain energy given to the molecule. As a result, if you know all the eigen-modes of a molecule, you also know which frequencies of infrared light they should absorb, which is very useful, since in experiment we do not “see” molecules (if we see them at all) as nice ball-and-stick objects. for wave-vector q (yes, it is the same as the q-point above), with i,j properties of the and atom of the system. Only for the center of the reciprocal space ( -point: q=(0,0,0)) the matrix D is real, for all other points, D is a complex matrix. The eigenvalues of this matrix are the square of the vibrational frequencies we are interested in. Negative eigenvalues (i.e. imaginary frequencies) are often an indication of the non-convergence or instability in the structure. In other cases they are just an indication of numerical artifacts due to too low accuracy in the calculation. and checking which sign for the eigenvalue gives a result closest to the zero-vector, for the eigenvector . For the -point phonon frequencies, the SVD-implementation found in numerical recipes is sufficient, and after implementing the small hack to recover the sign, I was able to get the exact same frequencies as those directly available in the ab initio code (VASP) …phew. In this second step, the exponential part (which is now no longer trivially equal to 1) of the dynamical matrix needs to be explicitly included. and add liblapack.a and librefblas.a . To test everything, I used a very simple system: Bulk diamond, with only two atoms in the primitive unit cell, the dynamical matrix is only , allowing one to check the numbers during debugging. 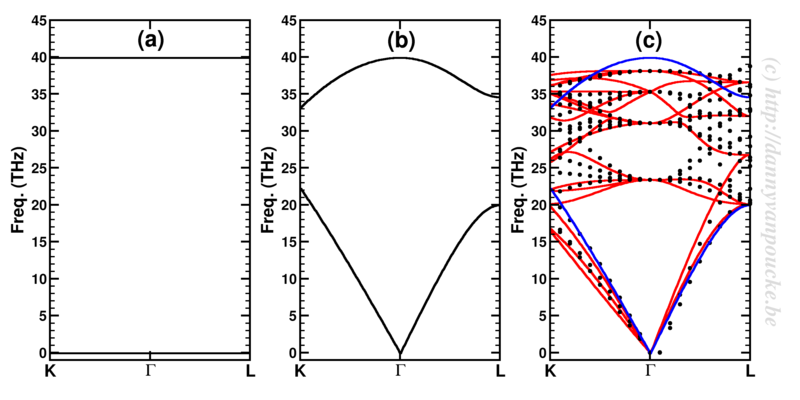 As said, the phonons at the -point were correct, however, upon turning my attention to high symmetry lines in the first Brillouin zone I got the left picture below, woeps. Using a primitive diamond unit cell with only two atoms, simple extension of the dynamical matrix leads to flat bands (a). Taking into account that the off-diagonal terms refer to the interaction between the two C atoms, and that each C atom experiences 4 such interactions, the dispersion of the bands becomes non-zero (b). Using a larger unit cell such as the conventional 8 atom cell, much of those interactions get explicitly introduced in the dynamical matrix (dotted lines in (c) ), while some are still missing for the atoms at the edge of the cell. The effect of their inclusion is shown by the red solid lines. (c) The blue solid lines show the bands of the primitive two atom cell (also shown in (b)) for comparison. But what happens with the conventional cell? Because most atoms already have all their nearest neighbors included the effect is much less pronounced, but still clearly present (the dotted lines and the red solid lines in the right panel above). Comparison to the band structure of the primitive cell shows this one to be already quite decent, despite its limitations. 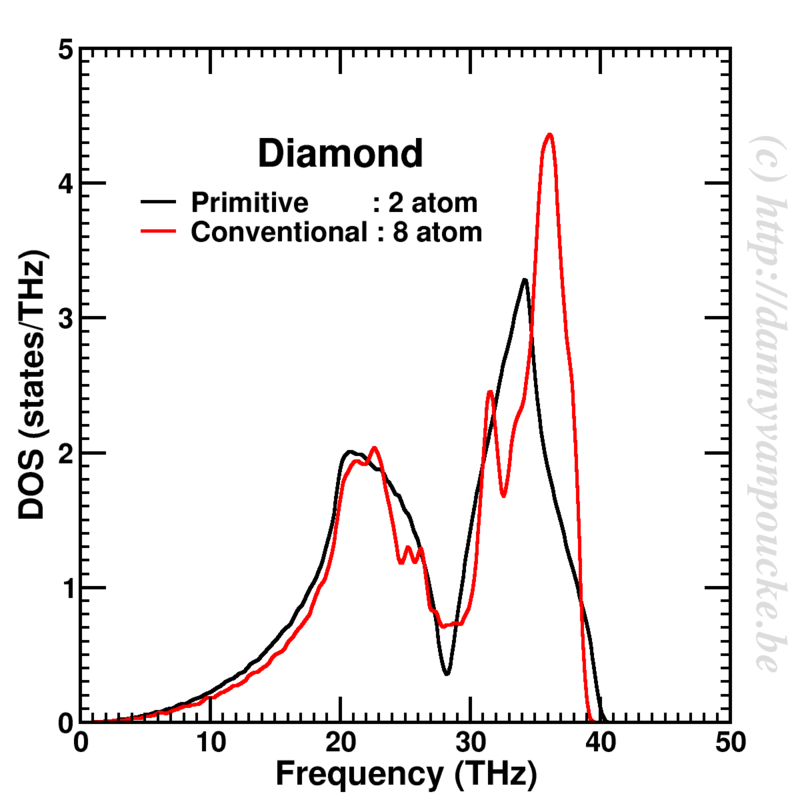 The phonon density of states for diamond, calculated using a dynamical matrix based on a primitive 2-atom cell, and a conventional cubic 8-atom cell. A Gaussian smearing of 0.3 THz is used to smooth the curves. Extending the computational cost further, we can also sample the entire first Brillouin zone (instead of only points along the high symmetry lines) and create a phonon density of states. The main hurdle in its implementation, is finding an algorithm for generating a set of q-points which only sample the first Brillouin zone. A brute-force approach creating a homogeneous distribution of q-points over a region larger than the first Brillouin zone, and then only selecting those q-points which are inside the first Brillouin zone is relatively easy to implement, although efficiency becomes an issue when you try to run through one million q-points on a 7-year old netbook. However, for now it suffices, and will allow me to generate phonon band structures and densities of state for my MOFs, and calculate thermal contributions due to these phonons…to be continued. hey could u possibly calculate any of the vibrational characteristics of a single -semi- 1D chain of all of the elements up to U? in (H + He + Li +…. U)order.. when ruining into a noble just have them touch very closely.. and if at all possible, with a strong magnetic and electrostatic field “parallel” to its length (-each- would then have a holographic 45 degree tilt to the chain…).. in particular (because this is so hard) do u at least have any idea what that proton doing? i suspect its in a few new states of matter lol… iv been working on the model for a while.. wondering what ull think of it.. a cheat u could use to make me infinitely happier would be to loop the crystal unit so the U and H “touch”.. …god its so beautiful.. In theory that could be done. Such a system however would be rather unstable and collapse to form a cluster (or multiple clusters) of the set of atoms. Looking at the first three elements alone you can imagine what would happen: He, being a noble-gas, would be kicked from between H and Li which would be fighting to form LiH. Something similar would happen around all other noble gasses as well, leading to the formation of NaF, KCl, RbBr and so on. So with respect to your question about what “the proton” (or the H atom for the physicists) is doing: probably not that much, just forming a bond with Li. I know, it is a rather boring answer with very little magic, I’m sorry. lol.. thats surprisingly just what i wanted to hear from you! thanks for taking the time to type that out. musta been painful. heh, have fun with ur models! keep in mind, the right frame and setting is the key.